Over 50 years ago, in 1964, the Surgeon General announced with the first Surgeon General’s Report on Smoking and Health that cigarette smoking causes lung cancer and that something should be done to prevent harm. This announcement served as a catalyst for tobacco control and research that has since prevented more than 8 million premature deaths. Today, Surgeon General Vice Admiral Vivek H. Murthy, MD, MBA released the 33rd tobacco-related Surgeon General’s Report on E-Cigarette Use Among Youth and Young Adults, the first federal government review of the public health impact of e-cigarettes.The report focuses on preventing youth and young adult use of e-cigarettes and includes information on the historical background, patterns of use and health effects among youth and young adults, the activities of e-cigarette companies, as well as policy and practice implications. E-cigarettes have become the most popular tobacco product among youth, with a quarter of middle and high school students reporting use in the past month, including 1 in 6 high school students. More than one third of young adults (18-24) had tried an e-cigarette by 2014, and 13.6% reported use. E-cigarettes have become a $3.5 billion dollar business in the United States, with the industry spending $125 million on advertising e-cigarettes in 2014. Nicotine products are not safe for youth. Nicotine can have toxic effects on the developing brain, increasing susceptibility to future addiction and affecting attention, learning, impulse control, and development of mood disorders. It also poses dangers for pregnant women and fetuses. Research shows an association between e-cigarette use and use of other tobacco products. Over 58% of high school combustible tobacco users also used e-cigarettes in 2015, and there are five longitudinal studies showing a progression from e-cigarettes to other tobacco products. The Surgeon General also noted during the press conference this morning that more research needs to be done to determine if this relationship is causal. Surgeon General notes in the report, “although e-cigarettes generally emit fewer toxicants than combustible tobacco products, we know that aerosol from e-cigarettes is not harmless.” The aerosol that e-cigarettes produce often contains nicotine, ultrafine particles; flavoring chemicals such as diacetyl that have been linked to serious lung disease and other adverse health effects; volatile organic compounds and heavy metals. Flavors play a large role in youth e-cigarette use with 85% of e-cigarette users age 12-17 using flavored e-cigarettes. Youth and young adults cite flavoring as well as curiosity and low perceived harm compared to other tobacco products as their main reasons for e-cigarette use. At a press conference this morning, a 16-year-old talked about her experience trying e-cigarettes with her friends, saying, “It tasted exactly like a green apple jolly rancher,” but noting that she did not know the products contained nicotine or other toxins. 70% of middle and high school students reported seeing advertisements for e-cigarettes in 2014, most commonly in the retail setting. 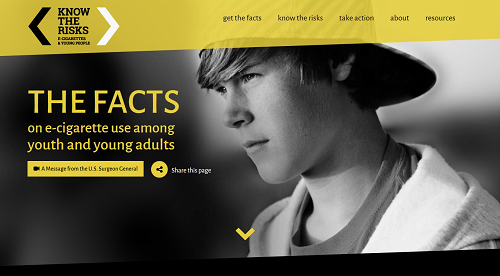 The 2012 Surgeon Generals’s Report concluded based on numerous studies that exposure to tobacco marketing causes youth tobacco use initiation. Evidence points to the same relationship between e-cigarette marketing and youth e-cigarette use. As for other tobacco products, price affects rates of e-cigarette use. As e-cigarette prices have declined, sales have sharply increased. This report calls on the industry to stop advertising and marketing e-cigarettes in ways that appeal and glamorize them to youth and young adults, using the same tactics the tobacco industry has used to market cigarettes. The report also notes that there is more to learn about e-cigarettes, including whether e-cigarettes can help adults quit smoking, but that question has not been answered with conclusive scientific data, and the report does not aim to address it. However, the report does conclude that we know enough to act to prevent youth and young adults from using e-cigarettes, and that following the precautionary principle, we should act to intervene. educational initiatives targeting youth and young adults. Other goals for moving forward include 1) do no harm 2) provide information about the dangers of e-cigarette use among youth and young adults, 3) continue to regulate e-cigarettes at the federal level to protect public health, 3) promote programs and policies at the state and local levels to prevent e-cigarettes use among youth and young adults, and 5) curb advertising and marketing that encourages youth and young adults to use e-cigarettes. Visit the report’s accompanying website geared to parents and young people. Learn more about e-cigarettes at the point of sale in CounterTobacco.org’s Evidence Summary.